Rosy sunsets are not common on the coast of Naknek Lake, where much of the year this finger of land is shrouded in fog and rain. An icon of Alaska, the brown bear completes the scene. Brown bears are different from their interior cousins, the grizzly, in that they feed primarily on salmon and clams, while grizzlies depend on roots, berries, and carrion of perished animals. 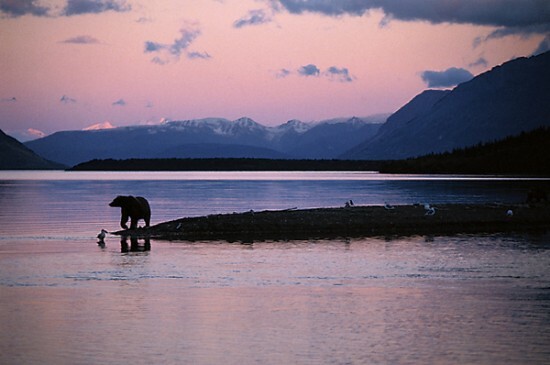 All summer long, brown bears fish and wade the shallows, refueling their fat reserves for winter.